Each of our minds contain a universe, but how is it that his mind contained fourteen or fifteen of them? Aaron Swartz at a Boston Wikipedia Meetup in 2009. By Sage Ross (Flickr: Boston Wiki Meetup), via Wikimedia Commons. I had other plans for how to spend my Saturday. I had other plans for my next blog post here at The Nation. 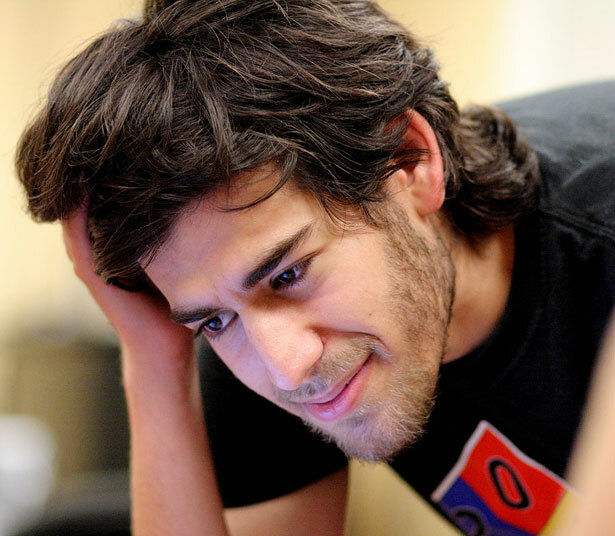 Then I learned my friend Aaron Swartz had committed suicide, facing a baseless, bullying federal indictment that might have sent him to jail for decades, and fate demanded this be a day to remember. I remember him contacting me out of the blue—was it in 2005?—and telling me I needed a website, and did I want him to build one for me? I smelled a hustle, asking him how much it would cost, and he said, no, he wanted to do it for free. I thought, What a loser this guy must be. Someone with nothing better to do. How long was it before I learned instead that he actually was a ball of pure coruscation, the guy who had just about invented something called an “RSS feed” and a moral philosopher and public-intellectual-without-portfolio and tireless activist and makeshift Internet-era self-help guru and self-employed archivist and what his deeply inadequate New York Times obituary called “an unwavering crusader to make that information free of charge”—and, oh yes, how long was it after I heard from him that I learned that he was, what, 20 years old? My friend Jon Stokes reminds me of the time Jon invited me and my then-wife out to dinner, and Aaron tagged along—he was an inveterate tagger-along, a modern-day Luftmensch—and explained to us this thing he helped make called Reddit, which I did not understand at all. I didn’t understand anything about that part of his professional world; it was only that he somehow understood everything about my professional world. All of our minds, each of us, contain a universe, but how is it that his mind contained fourteen or fifteen of them? I remember when we all went to a talk by Barbara Ehrenreich at the Newberry Library in Chicago—the Internet tells me it was 2006—and he spent any down time in the activity around him doing this weird thing on his cell phone, fingers flying. Which added up to two memories: one, of a soul squeezing meaning out of every last second of his life. And two, of the first time I saw a person send e-mail from a machine he kept in his pocket! Afterward, at a restaurant, I remember him patiently but exuberantly explaining to Barbara Ehrenreich what RSS was (“a computer code that provided a format for delivering regularly changing Web content”: yes, he thought of that), what Reddit was, why it mattered, etc. He was also the first person I knew who wrote five-word e-mails, no more information, and no less, than what he needed to convey, Twitter avant la lettre—like all of us now; we are all Aaron Swartz. Poor professor. I quote the memo verbatim because I imagine Aaron doing so, too—maybe he used that little computer in his pocket to look it up. Yes, and not a person of pure data after all. I remember the time, at the height of our friendship, when he announced he was taking a month off from connecting to any computer. I remember him telling me afterward about what it felt like: glorious, radiant, strange, alive, true (he mostly read history books). Dude got to see what it was like outside Plato’s Cave two separate times in his life. How many of us can say that? I think about how I’m able to pull together a sort of timeline of our encounters together—the time we went to the Newberry Library, a time a year ago we sat for coffee and he gave me relationship advice (yes: he had a body), the month-long computer hiatus—because smart, dedicated people like him worked very hard, often with no thought of personal profit or gain, making ours a world of useful data, making data useful, making it possible to have a record of the world as it goes by, making the world more meaningful by making data more human and shapable and direction-ful. He was one of those people: one of the best.